Posted September 22, 2014 by William Martin & filed under Headlines. 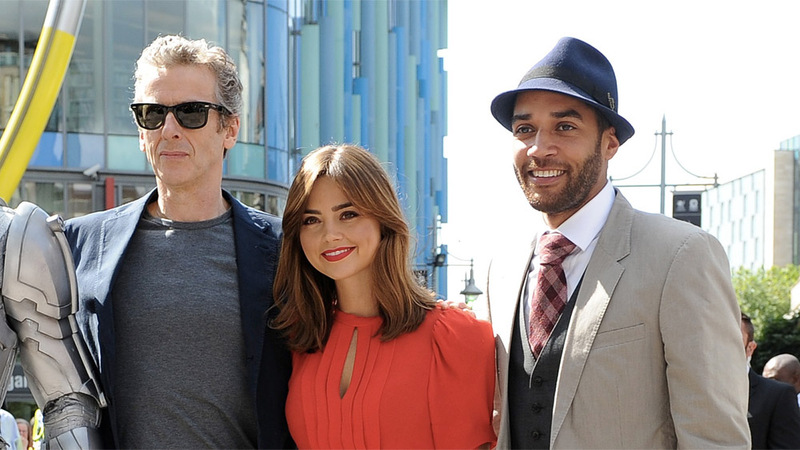 Steven Moffat has discussed how Danny Pink is different from Doctor Who‘s previous boyfriend characters. Samuel Anderson made his debut as Danny in Season 8’s second episode, ‘Into the Dalek’, last month. Ha. Moffat you are such a tease. The comic byplay between the Doctor and Danny is going to be hilarious and will contrast beautifully with the awkward and touching romance he has established between Danny and Clara. Nobody writes awkward and touching romance like Steven Çoupling’ Moffat Thank goodness Moffat has also insisted that Danny be written as a real person, not the tin dog that Mickey always was or the sappy Rory we had for most of series 5 and 6. Amy was such a strong and vivid character as portrayed by Karen Gillan and had such white hot chemistry with Matt ,that poor Arthur Darvill was always sidelined when those two were on the screen. Steven Moffat has given us what has been lacking since 2005 – a grown up proper couple in the Tardis who aren’t overawed by the Doctor and who have lives of their own. Sam Anderson is a brilliant addition to the team. I absolutely love Sam so far in this role. I love the Danny Pink character, he’s quirky but a little damaged, like most people and he’s a good back and forth for Clara. Been there done that. Every male companion in the new reboot is a competitor to the Doctor, usually for the affections of the female companion. I’d rather see them go back to the days with Jamie when they could just be best friends. Let’s be real, they were a little more than best friends. I didn’t get the “competitor” to the Doctor was meant romantically. He may not want to be romantically involved with Clara, but he does want her time and attention–which he will not have as much of if she gets a serious boyfriend. People can be just as jealous of a boyfriend/girlfriend taking their Best friend’s time as they can if competing romantically for the same girl/boy. It’s just a different shade of the emotion. They’re making it very clear that the relationship is not the same as with Matt Smith because that would be seen as creepy. But the jealousy is there none the less. Robot of Sherwood was a clear example of this. Frankly it was pretty annoying in that episode.